Used Mini Clubman Review - 2015-present | What Car? If there’s one thing we know about the Mini hatchback, it’s that it’s not very maxi inside. In short, space in the boot and rear seats is at a premium; it’s the penalty you pay for choosing such a cute, dinky small car. But what if it didn’t have to be? Well, that’s where the Mini Clubman comes in. In essence, the Clubman is an estate version of the hatchback, but that’s not quite the end of the story. While its small car origins might give you the idea that its main rival is the Skoda Fabia Estate, in fact it’s more spacious inside than that car, not to mention more expensive. As a result, the Clubman’s most natural rivals are the Volkswagen Golf – albeit the hatchback version thereof – and cars of its ilk. The engine range starts with a 1.5-litre, 134bhp petrol turbo in the cheapest Cooper models, or if you want more poke, you can go for one of the two 2.0-litre petrol engines – 189bhp and 228bhp in the Cooper S and John Cooper Works versions respectively – while for high-mileage drivers who need fuel efficiency, there are two 2.0-litre diesel engines, of 148bhp in the Cooper D and 187bhp in the Cooper SD. Standard equipment on the Cooper versions is generous, with cruise control, automatic lights and wipers and air-con all coming as standard. Cooper S models get sports seats and that more potent engine but very little extra equipment of real significance. 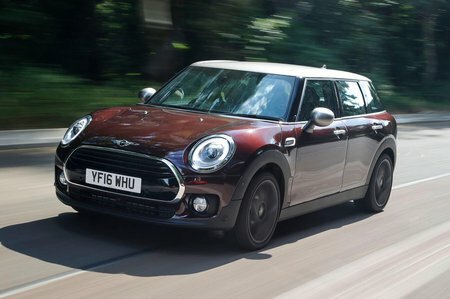 Having said all that, it’s worth shopping around for a Clubman that fits your ideal specification, because many will have been upgraded with the original owner’s picks from the expansive options list, not to mention two-tone paint effects and decals. For example, cars fitted with the popular Chili Pack, which adds climate control, LED headlights and rear parking sensors, are worth having. Mini has a reputation for building cars that are fun to drive, and the Clubman is no exception. Fast, direct steering means it turns in to a corner eagerly, while tight body control means it barely leans over as it does so. There’s loads of grip, too, and the chassis responds well to the throttle, meaning you can adjust your line as you go easily. In short, it’s far more fun that it has any right to be. The effect is amplified by the engines; even the cheapest petrol has a sporty sound and feels perky and responsive, while more potent models are genuinely fast. Diesels, too, have lots of shove, although they don’t sound quite as nice. The trade-off for the zingy character is that the Clubman isn’t the most comfortable car in the world, with a ride that’s rather firm and a touch jiggly around town. Having said that, it’s tolerably so, and its ride smooths out on the motorway enough that it rarely proves to be an issue. 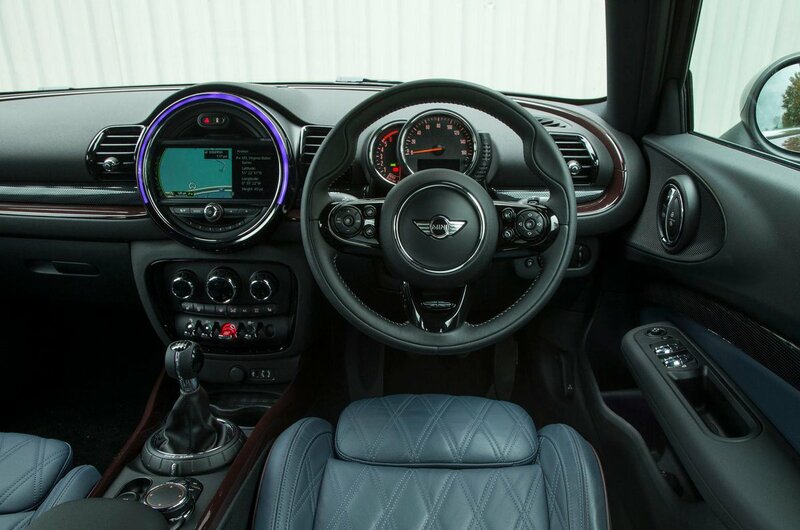 Inside, you’ll find an interior that looks like nothing else (well, with the obvious exception of another Mini), with a big central binnacle that houses the media display, cute chrome-effect switches and optional ambient lighting that allows you to choose any colour you like. It’s all built sturdily enough, too, although some family cars like the Audi A3 do it better. As we’ve discussed, space is reasonable by comparison with similar-priced hatchbacks, although the rear seats can still feel a touch cramped; they’re also a touch on the tricky side to get in and out of, due to the Clubman’s low roofline. However, they do at least fold down flat. The boot’s opening, meanwhile, is narrower than most due to the side-hinged doors, but the load lip is low and the luggage area is well shaped. Those side-hinged doors are also useful when you want to load smaller items, requiring much less effort to open than a traditional bootlid.